In early days it was very difficult to find dofollow blogs for commenting but now with the inventions of some online tools it become very easier to finds dofollow enable comment sites not in minutes but in a seconds. So this the best and better ways to finds these blogs by saving your precious blogging time. By using this tools you will get all the dofollow commentluv blogs on search search pages with instant of time which was not possible as compared to manually methods. So lets go how to use this tools for doing this job. PutMyLinks is the most prominent online tools with free of cost by which we could easily find all dofollow commenting blogs with very instant of time. Look at the screenshot of this online tool. DropMyLinks is another most prominent & tremendous online tools which give the opportunity to find all the dofollow commentluv and keywordluv blogs for commenting. So tools we personally use on PBT. 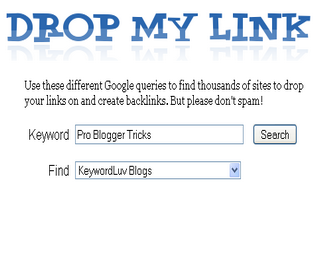 I would recommended to use dropmylinks because of easy to use and best one. Learn how to use this tools. Now You will be able to see two options boxes. "like this" The first one will be for keywords & the second one will show Find. Keywords: In keywords box you will insert a keywords related to your niches. Find: In finds box you will need to select which type of blog you want to search for. 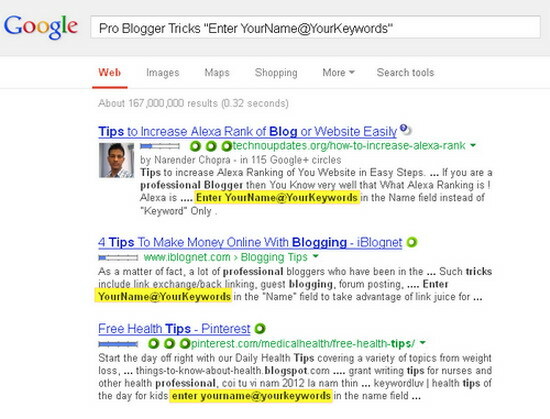 Now you will see all " Enter YourName@YourKeywords" with each blogs on google search page. I have also highlighted that in the above screenshots it means that all these blogs are KeywordLuv Enabled blogs which allow us to leave a comments with Commentluv option. Now visits this blog one by one and start commenting on them. it will be more better for saving your time to note all these blogs in excel file. Next time you can easily landed on them for commenting without finding by using this methods. Hi pals this was a little tutorial about how to find Dofollow KeywordLuv Enabled Blogs For Commenting. This is the only way to build strong readership and get quality backlinks for your blogs. It will also increase your blog traffics, valuable for Search Engine & have good PR. Make a schedule for commenting & try to leave a comments on 10 to 15 popular blogs with daily basis. By doing It will boost your post rank well in search engine. Hope this tutorial help you alot if you any query then do not hesitate to post your question in comments sections. Share Your Views With Us. I definitely agree with you bro Hafeez. Dofollow blogs really help in terms of building backlinks and driving traffic to a blog. That's one of the major reason you see bloggers using Wordpress platform getting more comments than Blogger users. I appreciate your effort. Thanks for sharing, and do have a successful weeks ahead.. Yes Victor Bro we know that wordpress blogs gets bundles of comments with each posts that is why because of enabling commentluv options on blog So that readers always engage with blogs every time. So it will be better for us ever if we want to build quality backlinks for blog then should be visited all these blogs. Thanks Victor Bor for appreciations hope to see u soon. Oh Really Manabadi. Thanks for thumbing Ups to PBT. we always want to see you here. Thanks buddy for thumbs up. Thank You brother, you made finding dofollow blogs easy. Thanks again. Yes Tharun Raj Bro In this you way you could easily find out all enable commentluv blogs with a seconds. Thanks for landing with us. keep visiting us. Thanks Manabadi for praising and saying such cute words. I really like your comments you always encouraging me. Thanks and hope to see you same in the futures. Thanks Mohammad Wali Bro see after long time here. Thanks & hope for engage with next tutorial. Damn amazing tutorial Hafeez bro. I want to add more in this article that if bloggers learn real power of blog commenting then they can do wonders with their blog. We need to keep lot of points during commenting on a blog to take best of best benefits from our comments. You really explain this post very smartly. Hats off to you dear. Yes dear there are many factors we should keep in mind before leaving comments on other commentluv enabled blogs. Thanks Ankit for your valuable comment we are appreciate your sounds. be around with PBT. see you soon. Thanks Zeeshan Brother for praising my Work. I will bring more awesome tutorial than this just try to keep yourself in touch with us. Zeeshan bro you are my loyalest reader then why are you leaving the comments with blog url it will not give you better rank, you should learn about penguin penalty 2.0 updates. You will be realized after reading it because you will be penalized if you do the same. Since google changed some algorithms, leaving generic comments is not longer a practical thing to do. One must engage in an interaction through comments. yes agree with you all points. to follow you point we can seo friendly and search result better .thanks for sharing Hafeez bro. It used to work well but not anymore. Do you have any more tips my friend for getting to develop good PR3+ dofollow backlinks? Thanks. should be tried, may be able to get quality backlinks ..
thanks Hafeez Khan, this is a really a great tips and search dofllow sites. it's really help full for me. It is really very helpful for me before this post I was searching for blog finder sort of tools. But almost every hurdle to search related blog is solved. Nice post sharing Hafeez bhai. It's helpful for new bloggers. What type of tools i can use to search do fallow blog commenting ? Woah! Funny how online sites help us find blogs to comment on this easy! I always tend to use that key terms you type on Google's search engine. I guess it has become the conventional one. To be honest, I hated that one. I'm grateful to find this new interesting way of finding blogs to comment on. The nicest thing is that they're actually dofollow. Quality blogs, I see. One of the best ways to not leave any backlinks footprints is to build backlinks from many sources. Cheap Backlink Building Service bring you 3 highly diversified link packages and build from a variety of sources. All of Your backlinks will come from high pr and quality such as Web 2.0, Social Bookmarks and Wikis. Nice post to increase your dofollow backlinks with commenting. I also read your other posts about increasing backlink and i have already bookmarked your site as it is informational and will keep helping me in the future. Thanks for the wonderful post. and i hope this will help me to increase my organic traffic for my blog ! But these all are Nofollow so nofollow comments are useless ?? What to do now ?? Ha ha ha...right...but it can increase your post rank well in SERP. if you want to increase page rank then read our this tutorial...top 20 dofollow backlinks forums..find in the search box. Bloggers are well aware about the fact that outbound do-follow links steal their rankings. Recently it has been noticed that no-follow links are also considered by Google, so bloggers are dropping CommentLuv from their blogs. If you are still searching for lists of CommentLuv enabled blogs then you are committing a big mistake. This will result in wastage of your precious time which can be utilized properly in other link building practices. If you manage to find some CommentLuv enabled blogs, still keep this fact in your mind that these blogs are using CommentLuv for just driving some commentators and they will quit using CommentLuv sooner or later. When they will quit using the plugin, you will loss all the links which you had built there. You will then start thinking that any scary update from Google might has penalized your blog but indeed that will be the gift of CommentLuv. Hi .Iam really suprised to see that backlinkhippo is not included in your list.It is better than dropmylink. Nice post for aspiring bloggers. Management institute in Noida are well equipped and rated as mba colleges noida.management colleges in noida. Great post. Any blog making use of the CommentLuv plugin, would give a link back to your site as long as you comment on their blogs. Dofollow blogs really something that we need to find to increase our search engine ranking but it's really hard to find. Thanks for sharing these great list of blogs it help me out. I hope not only me but also many got benefited by these list. 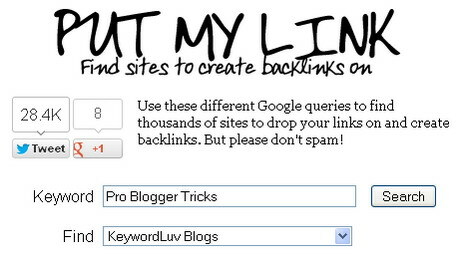 wow, nice way to get commentluv blogs to comment and build backlinks. What Should You Look for in a New Camera??? Before Buying a Digital Camera Read This??? Thank you for your nice posting. This is help full for all. This is a great resource, thank you very much for sharing. Will try to do commenting on a daily basis. on blogs that are do follow. very informative and thanks for sharing this. Hello Hafeez, how are you? You've done a good job - Indeed finding dofollow blogs in past times is not very easy. I have been using dropmylinks.com but I have never used and heard of PutMyLink.com. Glad you took your time on this, Thanks. This funny, I found your site on Drop My Link .com, I thought your article was about a blogger tutorial. Oops, my bad. your struggles is very excellent this site has helped a lot. really I appreciate such kind of topics. It will be very helpful for us. Thank you so much for the tips. It really helps a lot. Is it ok to get a backlink to your blog from a less reputed blog? All Time Print Provide best quality printing service for full color plastic business cards, plastic cards, custom gift cards in USA region. Broken down simply. Thanks for the help. thanks i will certainly follow your mentioned method for getting more backlinks. Great information, I come here all the time and am very happy with your updates.I was looking for this kind of websites to increase the backlinks, now I realize it is really important make sure are Do follow ones.thanks for sharing. Nice share...Keep with mate. You are rock. Amazing blog you have my dear, i was want it how can work and beneficial for us so i found the blog for information of blood pressure monitor, but i did not found that, but finaly i got your blog , this blog giving the good & beneficail information to all, so im very appreciate your blog, so thanks to you. Blog commenting is the best and safe way to get high quality dofollow backlinks instantly. really nice post and such a grate post . keep it up Driver Tuner 3.5.0.0 your article is awesome , i bookmark yor site , your links are 100 % working , and its updates version is so good as compared to old one , and such a amazing editing and modding the multimedia . Thanks for sharing such nice information about how blogger or people can find do-follow blogs to share their knowledge on it. You can also use some search operator for this. Thanks for let us know about how to find dofollow commentluv for blog. It is really important and play vital role for every blogger's life. It is also essential for blogger to rank blog in google. please have a look. Thanks for sharing such an interesting post with us, nice info you shared. keep sharing more. Thanks again. We learn everyday from the internet. Ohh Its Really great thing. Thanx for sharing it. I was Spending So much time on searching commentlv blogs. Bt these are nice options to do that. Nice post buddy, but i unable to find this. they ask for sign up first. Perfect guide for finding do follow blog commenting sites and we love to make comments on other blogs because it is important for seo. Is it better the have the comments related to the area of your expertise? lovers but thiss post is genuinely a nice piece of writing, keep it up. Very nice article, thanks for sharing this information.It is very useful for SEO purpose. Currently am using DropMyLink and SEOQuak its really awesome. As because now a days everyone want a backlink by commenting so this tool will be helpful for them. A long and awesome article. Thanks a lot for sharing this with us. Your blog is really informative. I use both these tools but, from his post, I have learn some advance tricks that's very helpful for me. how to delete all contacts on iphone i am searching for this keyword do follow websites can you help..??? ?